North Dakota had the dubious distinction of being named the #2 most dangerous state for driving in 2015, based on the number of fatal car crashes we see each year. Even if the wreck does not claim your life, you can be seriously injured in a car accident. Your injuries can leave you with chronic pain and life-altering consequences, such as limited ability to work or the need for extensive medical care that drains your finances. Working with an experienced attorney can help you get the compensation you need to adequately treat your injuries. At the Larson Law Firm P.C., our team of knowledgeable North Dakota car accident attorneys answers a lot of questions about car accidents and the pursuit of compensation for resulting injuries. We have gathered together some of those questions here to provide answers that may help you decide about moving forward with your claim. You should never agree to a recorded statement to either insurance company, and you should never talk to the other person’s insurance company without legal advice from an experienced lawyer. Your statements can and will be used against you to disprove the other company’s liability. Anyone who has driven down U.S. 85, I 94 or I 29 knows just how much traffic, and how many accidents, you can see in one day on the roads in North Dakota. Each state has different laws about how a party’s own negligence influences their ability to collect damages in a personal injury case. In North Dakota, if your actions are found to be at least 50% responsible for the accident, you will not be able to collect damages. However, if your actions were only 49% or less responsible for the accident, you can still seek compensation. Just do not make any statements about your own fault to the insurance company, as these statements can be used to reduce your reward. Only disclose this information to your attorney, who will better understand how to handle the matter in your best interest. What if the accident resulted from ignored traffic directions? Traffic violations that seem minor can result in accidents that cause serious injuries and even death. Our legal team fights to hold drivers accountable when these accidents occur. We work with specialists and experts to prove the fault of the other driver and demonstrate the extent of your injuries. We use that information to maximize the settlement for your injuries and minimize the impact the accident has had on your life. How much can I get for my accident? That depends. Our legal team looks at the damages to your vehicle and other personal property, the cost of your past and future medical care, how much time you lost from work, and your loss of earnings potential (if any), as well as the pain and suffering you experienced, among other factors. You may. We diligently try to negotiate a settlement with the insurance company without going to court, which will save everyone time and legal fees. However, the insurance company may push the case to court, thinking that it will have a better chance in front of a judge or jury. If that happens, our skilled litigation attorneys will put together the strongest case possible to prove your claim. While we know that a settlement is usually preferred, we are not afraid to fight for your compensation in court, should it become necessary. What is the Colossus format? Colossus is software used by insurance companies in the evaluation of claims and calculation payout amounts. It is the most widely utilized injury evaluation program, used by some of the country’s largest and most popular automobile insurance companies. While these companies assert that the program helps promote consistency among the handling of bodily injury claims, several consumer advocacy groups allege that companies are able to manipulate the score, resulting in significant underpayments to injured parties. This is only one of the numerous tactics insurance companies use to deny injured victims the money to which they are entitled. We which companies utilize Colossus and have a track record of successfully countering their insufficient settlement offers. 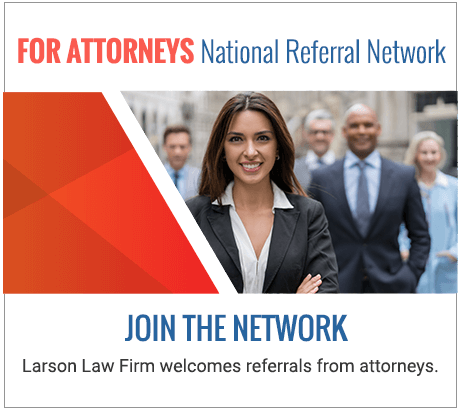 At the Larson Law Firm, our legal team collects a fee based on a percentage of the compensation we are able to get for you. There may be other legal fees related to court costs and so on, but the only attorney’s “fee” you will pay will come out of the award you win. We do this to remove the burden of paying upfront legal fees. We want you to focus on healing, while we focus on your legal options. Do I really need to file a suit? Should I just take the settlement the insurance company offers me? Never just take the settlement that the insurance company is offering you. That settlement is always going to be less than the insurance company thinks you can get. After all, the insurance company is trying to save money — and preferably not to pay you any money at all. By working with a skilled personal injury attorney, you will almost always get a bigger settlement than you would have by just dealing with the insurance company on your own. In many cases, the settlement will be significantly larger. The car accident lawyers at the Larson Law Firm P.C. have spent decades fighting to get people the compensation they deserve after being injured in a car accident. If you have been injured in a car accident or have a loved one who has been killed in a car accident, you need an experienced attorney who will fight for you. Call us today at 701-484-HURT or complete our contact form to schedule a free consultation with one of our experienced attorneys. From our office in Minot, we serve clients throughout Ward, Williams, McKenzie, Pierce and Mountrail Counties.